Cotton-picking is done by children all over the world, but particularly in countries whose economies rely heavily on its harvest - like in Ivory Coast. 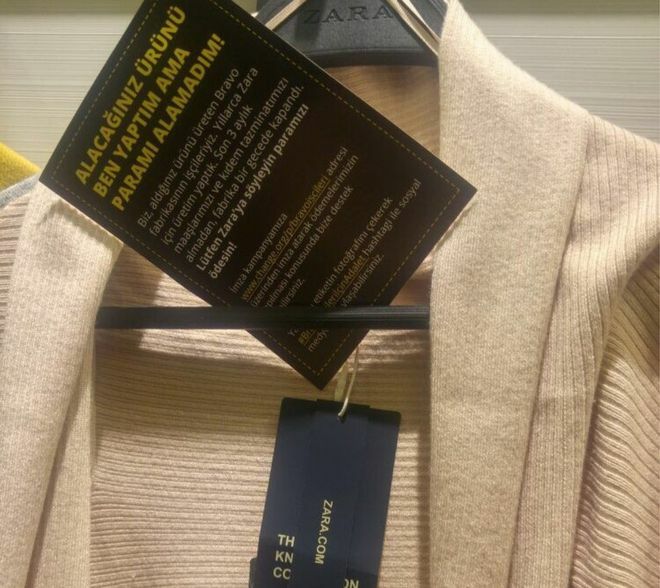 Shoppers at Zara stores across Istanbul found unusual tags left on garments, hidden in the crease of a pair of jeans or in the pocket of a jacket. The tags were left by workers from local company Bravo Tekstil, which produced clothes for Zara and other big international brands like Next and Mango. The manufacturer went bankrupt overnight in July 2016, and its workers said they were not paid in the period up to its closing. Now, they ask Zara to compensate their losses and pay them three months of back wages and severance. UNICEF is partnering with Norway's wealth fund, the biggest of its kind in the world, to resolve the issue of children working in the fashion industry. [Both institutions have] created a network of between 10 and 15 of some of fashion's biggest companies in order to work together over the next two years to solve the problem of child labour. Foxconn, a main supplier for Apple's iPhone, says it has stopped interns from working illegal overtime at its factory in China. It comes after a Financial Times report found at least six students worked 11-hour days at its iPhone X plant in Henan province. About 3,000 students were reportedly hired to work at the Zhengzhou plant. Apple said the secondary school students worked voluntarily but they "should not have been allowed to work overtime". The Guardian reports on the hardship endured by domestic workers in Tanzania. Recruiters target rural families to send their children into domestic work in Zanzibar city, a place popular with tourists. Whilst some are placed with decent families, many face a life of exploitation, fear and isolation. According to the US state department, the trafficking of girls into domestic servitude is Tanzania’s biggest human trafficking problem. What is happening to children in Tanzania is happening to many others across the world. The UN’s International Labour Organisation estimates that more than 17 million children between five and 17 are engaged in domestic work globally, either in their own homes or employed by other families. One-third of these are trapped in what the ILO considers hazardous work, exposed to violence and abuse, overwork and with no access to healthcare or education.